HTC to Mac Transfer| How to transfer HTC music, videos, contacts, photos, SMS, notes to Mac? Sometimes we feel that half of this world has become “Apple world” since iPhone, iPad or iPod can be seen everywhere. However, there are still a surprising number of people with Android phones — HTC, for example. For whatever reason, someone has a Mac and a HTC, and they don’t always know how to make them play nice together. 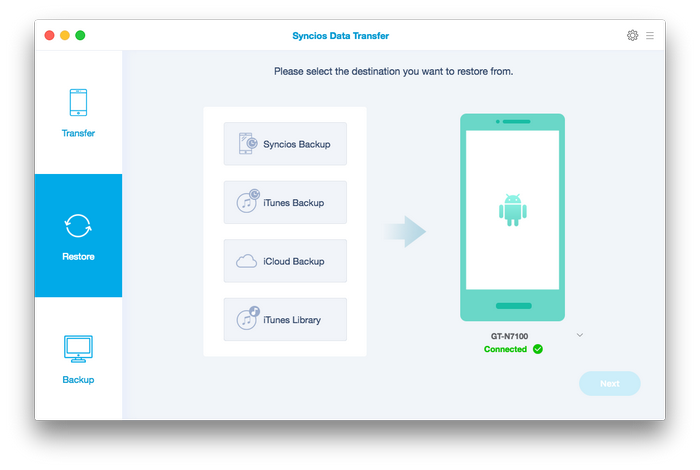 In this article, you will learn steps to backup your HTC to Mac perfectly, especially transferring some important and valuable data from Android to Mac, such as Music, Video, Contacts, SMS, Call log, Photo, Apps and more. We present the following complete, easy-to-follow instructions on how to connect your HTC and Mac and transfer files between the two. 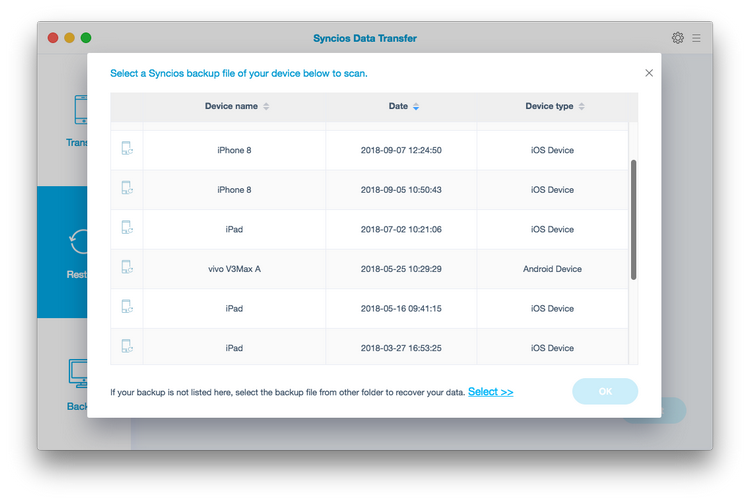 But don't forget to install Syncios Android to Mac Data Transfer Tool before getting started. One-Click backup multiple files to Mac, including audio, video, contacts, call history, SMS messages, photos, apps, etc. Extract iTunes backup to Android devices. 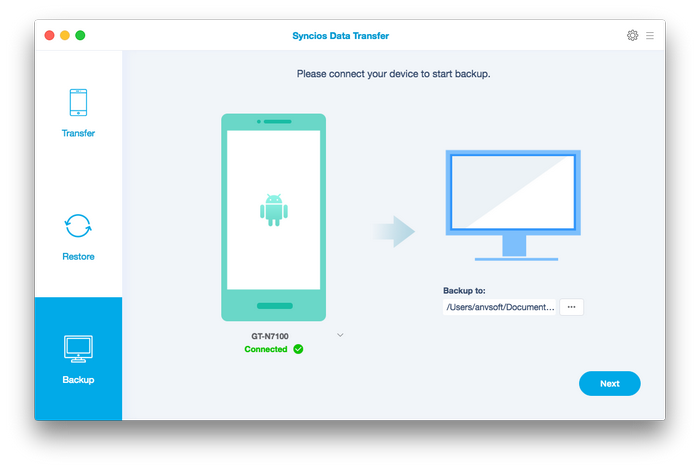 Restore backup files to mobile whenever you want. Transfer data from phone to phone by one click. What is supported being transferred from HTC to Mac? How to Transfer Data from HTC to MAC? Install HTC to Mac Transfer on your Mac computer (OS X 10.9 or above). This application will let you backup and restore files between your Mac and your phone. Plug your phone into Mac using USB cable. On the homepage, you will see three modes, simply click on the bottom right one: Back Up Your Phone. On the following page, you are allowed to select file types to transfer to your Mac Pro, Macbook Air or iMac. Check items you would like to copy to Mac in the middle and click "Next" button. It enables you to select your backup path on Mac from right panel, and shows available space for backup. After a while, all of your Android data will be saved on Mac. You can navigate to your backup folder to find your music, videos, pictures, contacts and more. How to Transfer Files from Mac to HTC? If you have already installed Syncios Data Transfer, things becomes easier. Simply launch it and Click on the upper right mode: Restore from Backups. Don't forget to connect your HTC to Mac. During restoring prcess, do not unplug your phone. Now, you are able to select your previous backup files from left panel, and choose specific data from the middle checkbox. The program enables you to restore your iPhone, iPad backup files or iTunes backup files to your phone. After selected, click on "Next" button to transfer data from Mac to HTC. It takes few minutes to go throught the motions of downloading files to your phone, depending on your data size.